Is there a geek in your life you would like to buy a gift for? There are more gadgets, gizmos and cool gifts around for those with a little geek inside them than ever before, probably because we are now willing to admit that there’s a little ‘geek’ in all of us. Maybe one of the following ideas will be perfect for you or your loved one. Who didn’t pass hours building and trying out paper aeroplanes when they were a kid? Well, some of us still carry on doing this even when you might think that we are old enough to know better. If you know someone who loves testing the aerodynamic qualities of folded pieces of paper then the Power Up 3.0* could be ideal. You just add the power module to your own paper plane and see whether it helps it soar up into the heavens. The world is filled with Star Wars gifts for geeks, which means that it is just as well that it is also filled with geeks who are Stars Wars fans. You could choose from a huge range of different objects in this respect but maybe a framed Star Wars painting is most likely to catch your eye. You can buy cheap ones for £20* or less but you could also easily spend £1,000 or more on a top quality one. Moulding stuff like putty with your hands is a fun way of passing some time or relieving stress while working. 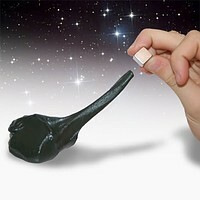 A cheap and fun variation on the traditional approach is to use magnetic putty. You can get this on Amazon for about £5.99* and it does remarkable stuff when you put a magnet or metallic objects near it. It could make your geek’s desk the trendiest place in the office. Do you want to find a gift for a geek who is never far from his PC? Well, a great idea is to get gadgets which are USB powered. For example, a USB cup warmer* will mean that no matter how long he spends glued to the internet his tea will never go cold. It only costs a tenner too. Do you know someone who would just love to own some land on another planet? How much do you think an acre of prime Martian real estate costs anyway? You might be surprised to find that it only comes in at a little over £20. You get a map and the deeds with it, although your geek will need to wait a little before they have any chance of visiting it and laying the foundations of their new home. Ok, let’s have a bit of fun for a second and imagine you had an almost unlimited supply of cash to spend on the gift. There is a huge amount of expensive geeky gifts around, from jet packs to yachts with volcanoes and from diamond encrusted phones to sapphire hard drives. However, the one which caught my eye was the tallest iPod docking station on the planet. 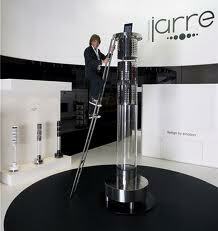 Musician Jean Michael Jarre designed it and it is so tall that it comes with a ladder. 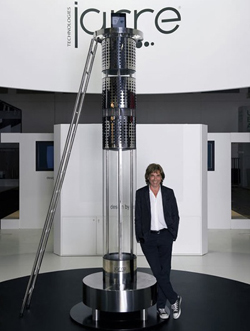 Standing at 11 foot tall and delivering 10,000w of power, the price tag of about £340,000 sounds kind of reasonable. It’s called the AeroDream One, if you want to look it up. What other great gifts for geeks have you come across lately? Were Things Really as Cheap in the Old Days?